I’ve been struggling to find time to write the blog recently, a reflection of just how busy 2016 has been. It has been an amazing year now I look back on it; in terms of the amount of work, the size and ambition of the projects undertaken but also just the sheer breadth of what we’ve done. 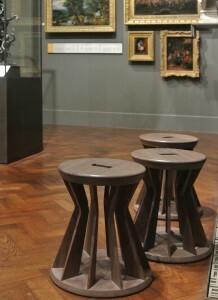 This time last year we were just finishing off work on two museum projects; one being some stools for the newly refurbished V&A Europe 1600-1815 galleries learning area, the other being furniture for the Watts Gallery in Surrey. On both of these projects we worked in close collaboration with ZMMA Architects, a dynamic London practice we have strong connections with. You can in more depth about these museum projects on the blog by clicking here. Highly challenging museum work with ZMMA Architects for the Watts Gallery (right) and the V&A Museum (left). 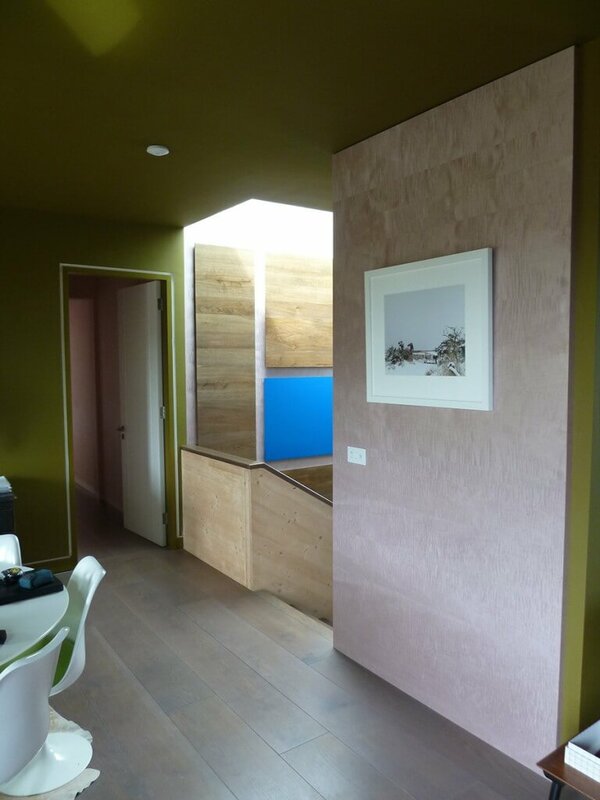 As the museum projects came to an end we were just gearing up for our first big project of 2016, the interior of a large contemporary CLT (cross laminated timber) built house on the North Norfolk coast called Bliss Blakeney. It’s not our normal stomping ground but the project and the clients meant it wasn’t one we wanted to miss out on, besides getting to know a new part of the world is an added bonus. We were asked to design the entrance hall and stair areas, kitchen, living / snug area, bar, library, bedrooms and dressing rooms. 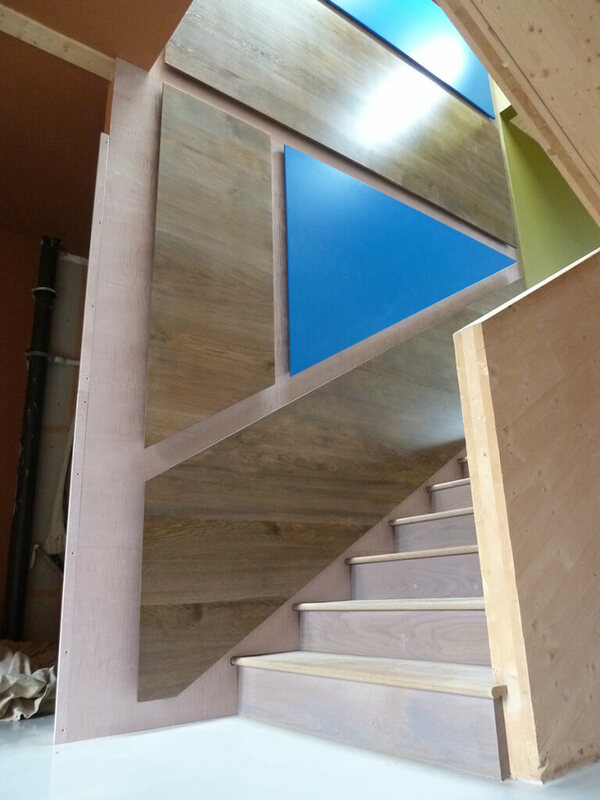 The first half of the year was very much focused on the Bliss project, we ended up completing the abstract stair panelling, the very funky kitchen, the snug and the library areas before drawing a line under it. The next elements are due in 2017, so hopefully this time next year there will be more images to see. Bliss Blakeney on the North Norfolk Coast, full of colour and creativity and came to define the first half of 2016. We still need to get the space properly photographed, but even from our site snaps you can see this is a bit special. 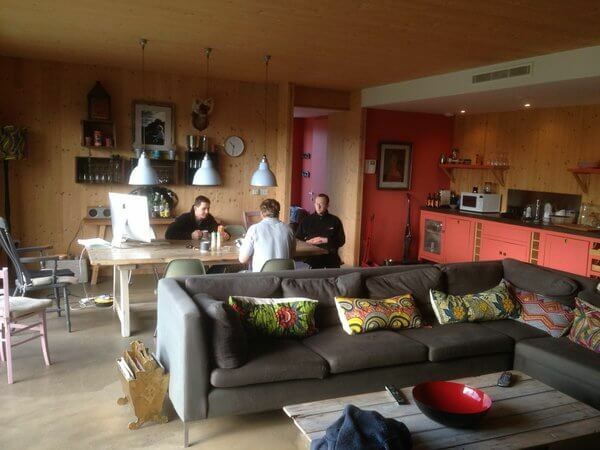 Despite being a long way away the site fitting was always a pleasure because we could get put up in the luxury ‘Cabin’, a four bed self contained wing of Bliss where the team could chill out after a long day’s work. The local pubs were great and so was landscape of North Norfolk coastline. It’s not often we do describe the fitting part of a project as a ‘pleasure’, but this was certainly true of the Bliss Blakeney project. The daily breakfast meeting discussing the fitting day ahead in the ‘Cabin’ at Bliss Blakeney. The other big news of 2016 was our collaboration with Sitting Spiritually, the garden furniture and swing seat makers from Lyme Regis. Late in 2015 they approached us to design a new contemporary swing seat for them. They had seen the work we had done on the Tudor Arcade Public Seating project and our prototype ‘Floating Benches’ with scorched and natural oak and wanted to harness that look in a new swing seat. Out of this came the ‘Yakisugi’ swing seat in 2,3 and 4 seat versions. We also licenced the Floating Bench to Sitting Spiritually and developed one and two seater versions as well as the original generous 3 seat bench. This became the ‘Simon Thomas Pirie Contemporary Range’, sold exclusively through Sitting Spiritually, but designed and made by us. 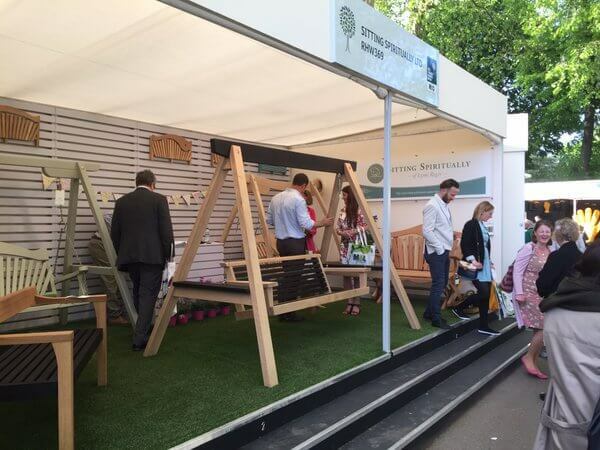 We don’t have a high profile in the garden furniture world, but Sitting Spiritually do and they take a stand at the prestigious RHS Chelsea Flower Show every year. 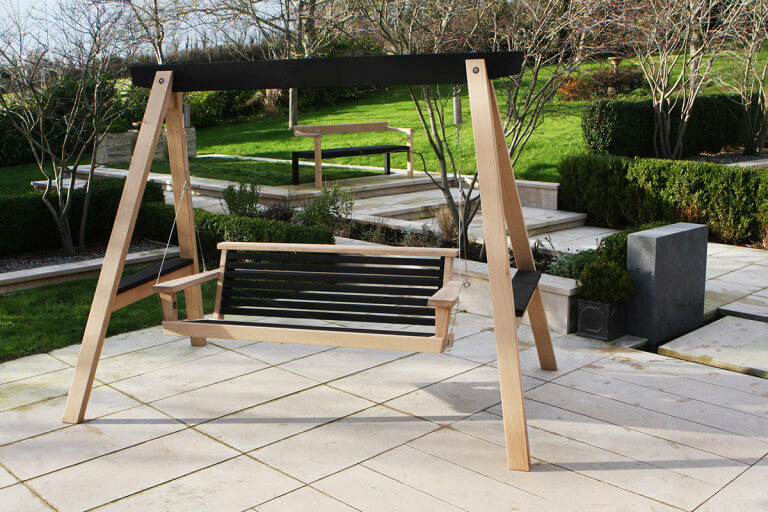 It’s the build up to that where the Yakisugi Swing Seat but especially the Floating Bench got huge attention – getting shortlisted for RHS Chelsea Garden Product of the Year. Images ended up in every paper and supplement imaginable. Post Chelsea it was a key feature in two RHS Gold Medal award winning gardens at Hampton Court and Tatton Park, with plenty of BBC TV coverage to boot. It’s nice seeing other garden furniture suppliers trying to play catch up – the scorched and natural oak combination was definitely the hot theme of 2016! I don’t think I’ve ever designed something that has ever got quite so much attention in a short space of time. 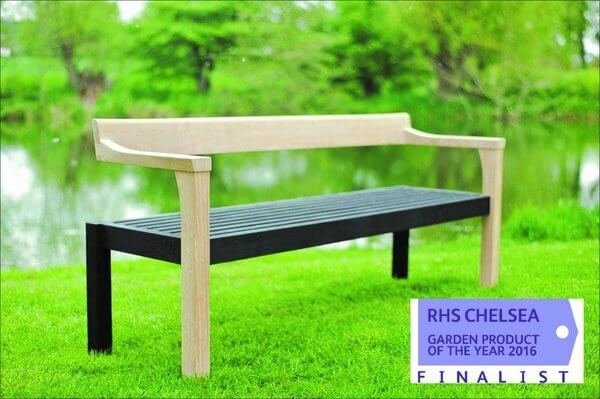 The middle of the year saw us making healthy batches of the swing seats and Floating Benches and we are already discussing what’s going to be on the RHS Chelsea Sitting Spiritually stand for 2017. Sworn to secrecy though! 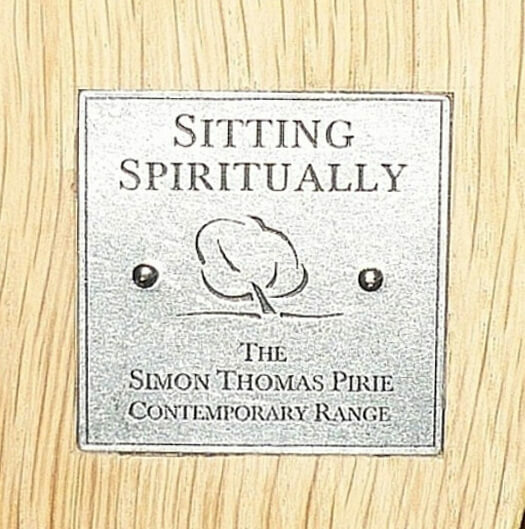 For more about the Simon Thomas Pirie Contemporary Range which is sold exclusively through Sitting Spiritually visit the Sitting Spiritually website. On the collaboration theme we continue to build relationships with interior design practices, high-end developers and architects. They come to us for our very bespoke skill set and the fact we can help them elevate their concepts into something real and exquisite. One such project was with Jigsaw Interior Architecture and AMD Developments in a new property by the river in Christchurch. 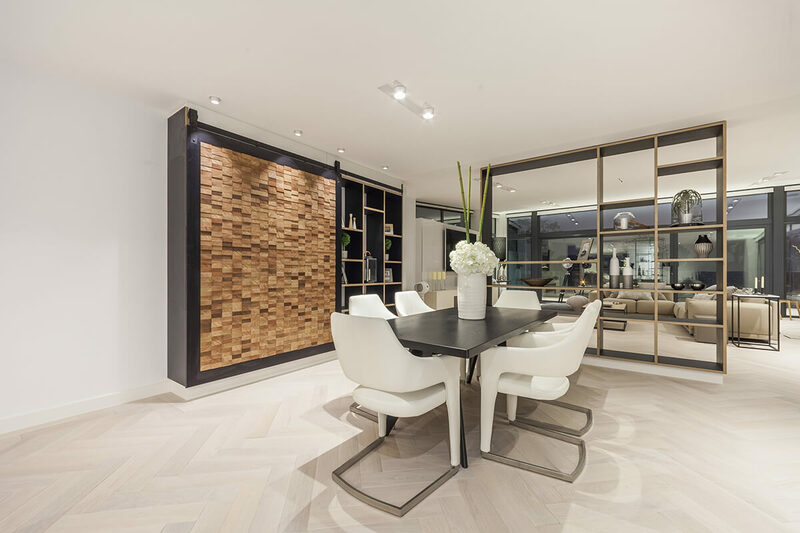 This stunning contemporary build utilised a very calming neutral interior palette which is both elegant and subtle. 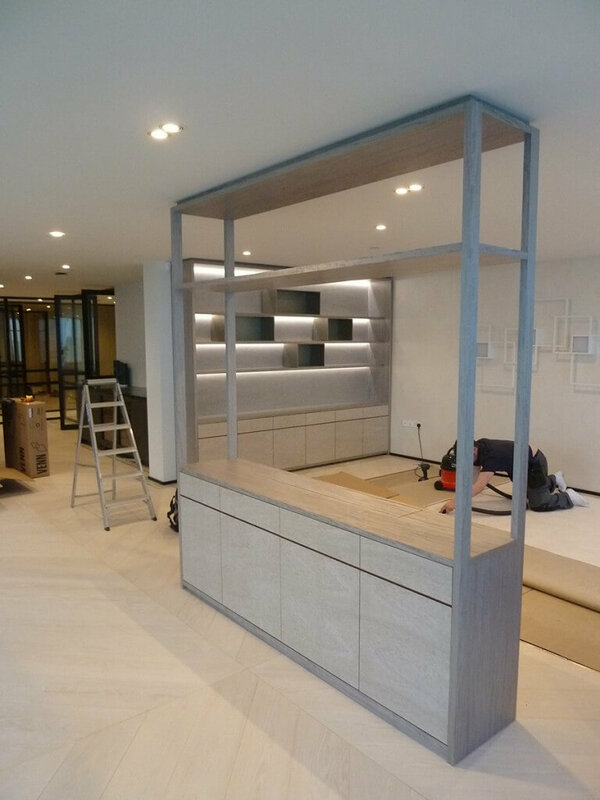 We were asked by Jigsaw to work on the staircase liaising with the metal fabricators to produce the timber stair treads and landing elements as well as a couple of large room divide / display storage shelves. These were made in a birch ply and a black face veneer. They look simple but were much more tricky to make then they initially appear. One of these had a large siding end grain panel on industrial castors that covers half of the display space. 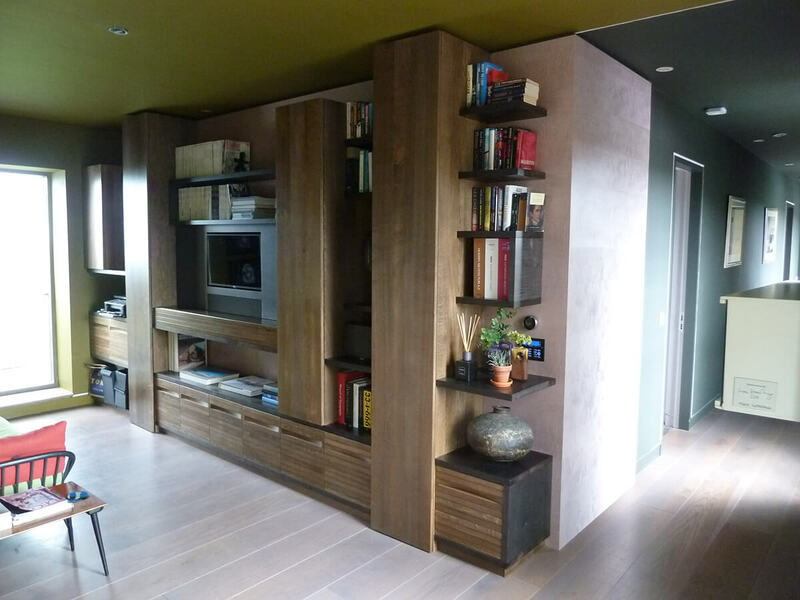 The living and dining space shelving in ply and black tulip wood at Wick Lane – Scheme by Jigsaw Interior Architecture. There is more detail and more images of this project on the blog – click here. We are working on other schemes with Jigsaw, as well as with other interior design and architectural practices on some very exciting varied projects for 2017/18. 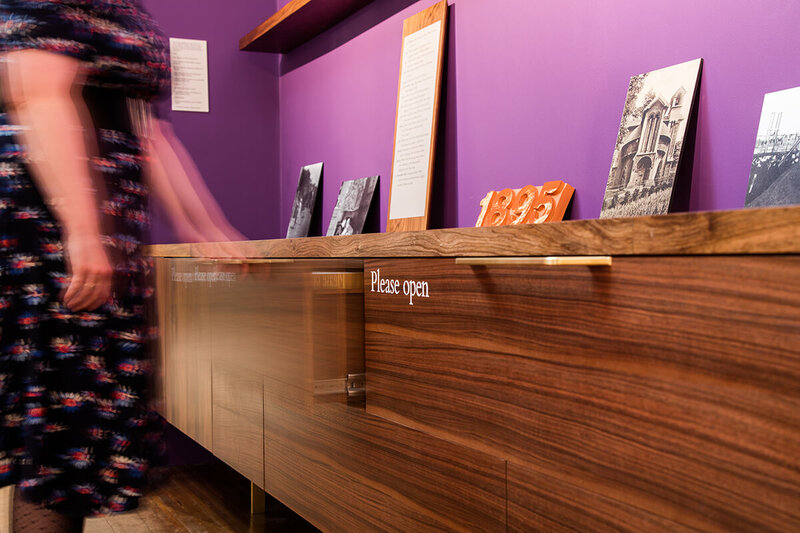 Three years ago we decided to pursue more of this kind of work (as well as our own generated furniture, kitchen and interior commissions) and it has certainly paid off, giving us a much longer project horizon. It means we have have stuff penciled into the schedule 18 to 36 months ahead and properly firmed up for up to 18 months. From a business perspective it just means we can plan ahead and feel secure. If the first half of the year was shaped by the Bliss project, the second half would be equally dominated by another project with a snappy one word name: ‘ACE‘ is a new apartment block on the desirable stretch of coastline at Sandbanks, Poole. We were only involved in the Penthouse flat, which has views over Poole harbour to one side and the open ocean, with panoramic views from the Isle of Wight to Old Harry Rocks on the other. We were invited to tender for all the fitted furniture elements except the kitchen on this by Woadden Nash Interiors in conjunction with Westcoast Developments. 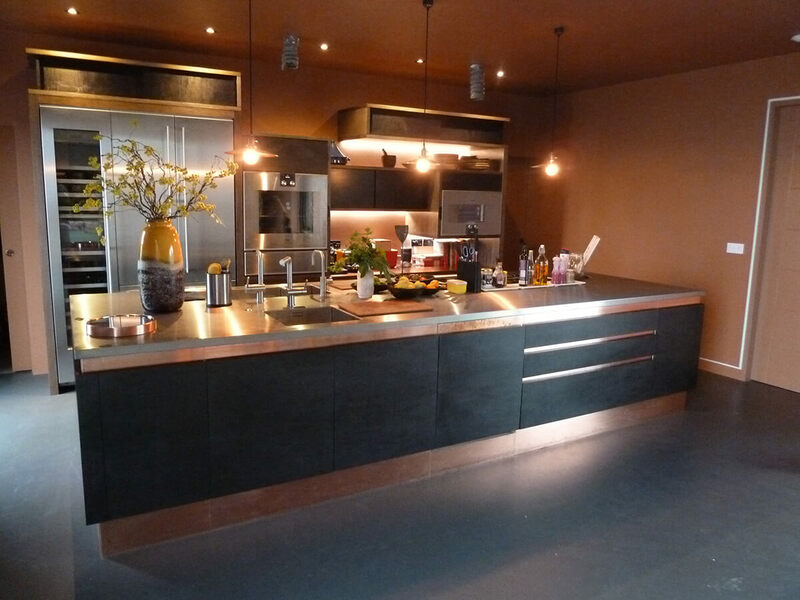 The building was being built by Colmar Construction who we had worked with very successfully on the ‘Fire & Water’ kitchen in 2015. We have known the team at Woadden Nash for some time and had come close to working with them on a couple of projects before, so it was lovely to finally secure something this big. 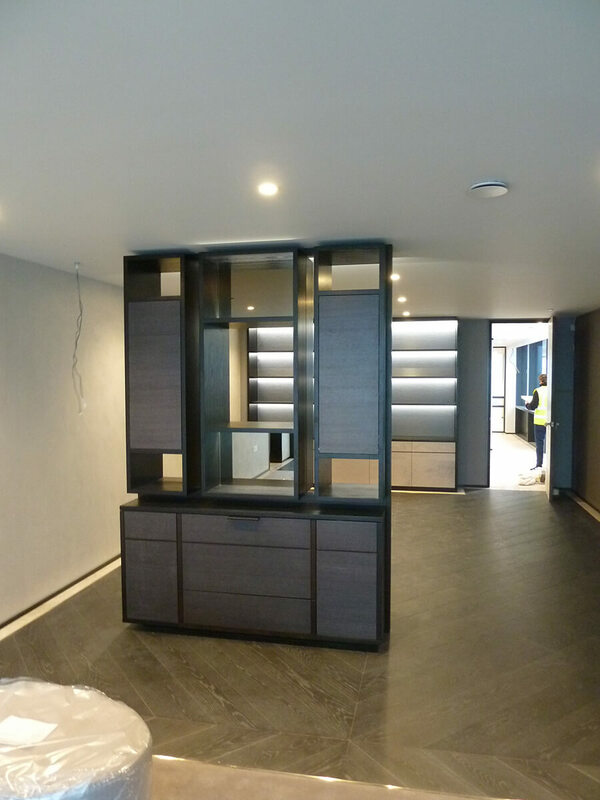 The finishes are rich and opulent throughout the scheme, with lots of use of Italian coloured Tabu veneers on the furniture as well as a very dark brown sprayed oak throughout as a constant repeating theme on the furniture and internal joinery. 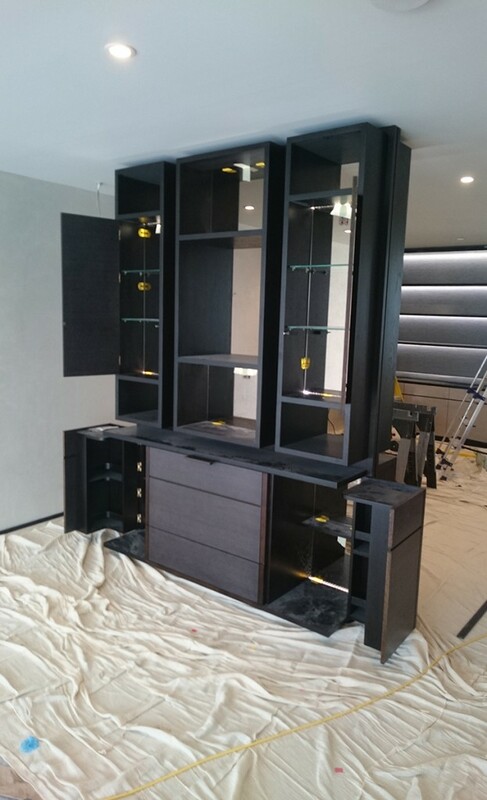 Images of work during fitting at ACE Sandbanks, the project that has defined the second half of 2016. 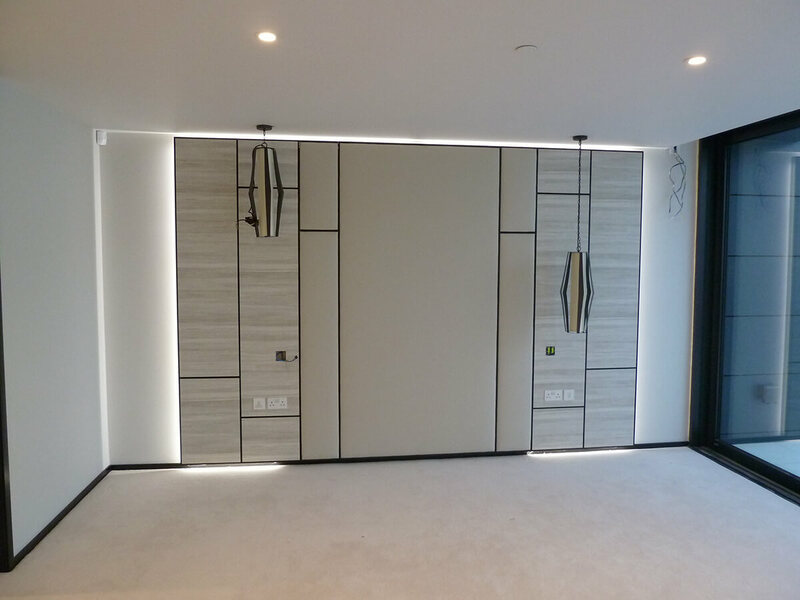 We worked intensively with the Woadden Nash, Westcoast and Colmar team on developing very narrow 35mm skirtings, picture rails and decorative door linings throughout the apartment and these were the first elements to be fitted. The furniture consisted of all the wardrobes and dressing rooms in the 4 bedrooms, dressing tables, master en suite bathroom cabinetry, master bedroom furniture and panelling, shelving and TV cabinet for the living area, as well as the shelving for the night lounge / study. 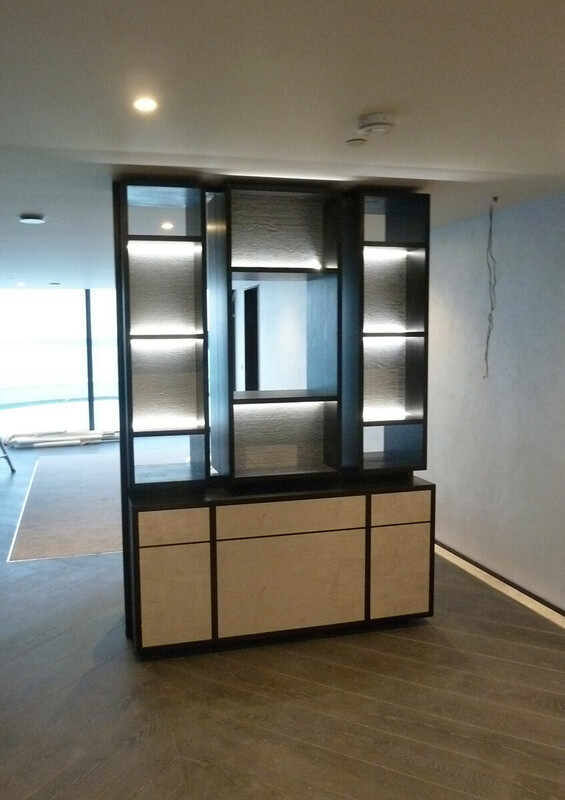 Last but not least is the two sided bar cabinet which stands in the centre of the room – my favourite piece on the project. Still to get professional shots of the ACE and Bliss Interiors but i’m hoping the portfolio book and websites will be bulging with lots of exciting images and full length case studies very soon. For all this talk of big projects and doing complete interiors we do still love making small individual pieces of furniture, it is after all at the very core of what we are as makers and designers. When you are working on projects that take months to design, months to make and almost as long to fit then snag, it’s rather refreshing to see smaller commissions designed, made and delivered in weeks. It’s important for us to get a nice mix of projects, so I’m as happy designing a small side table as I am a kitchen or library. 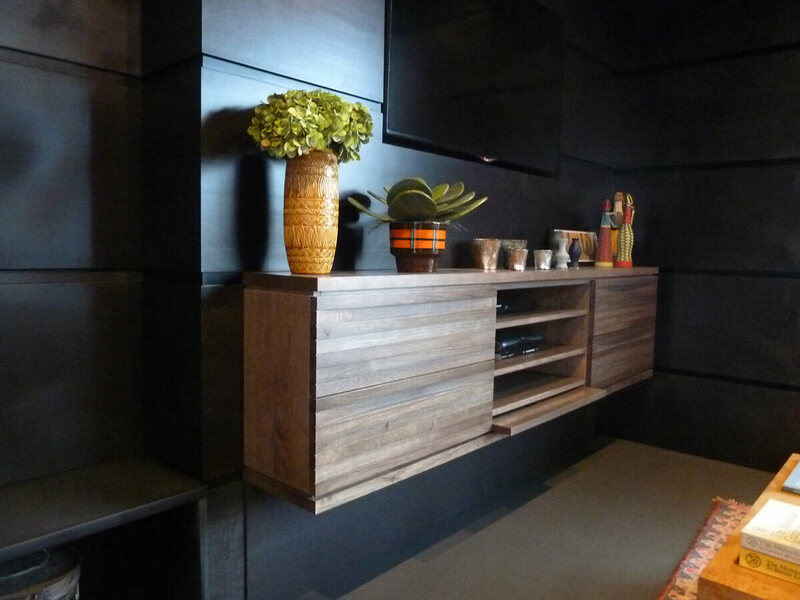 We’ve had a few furniture pieces that have stood out this year and perhaps some images can say more than words here. 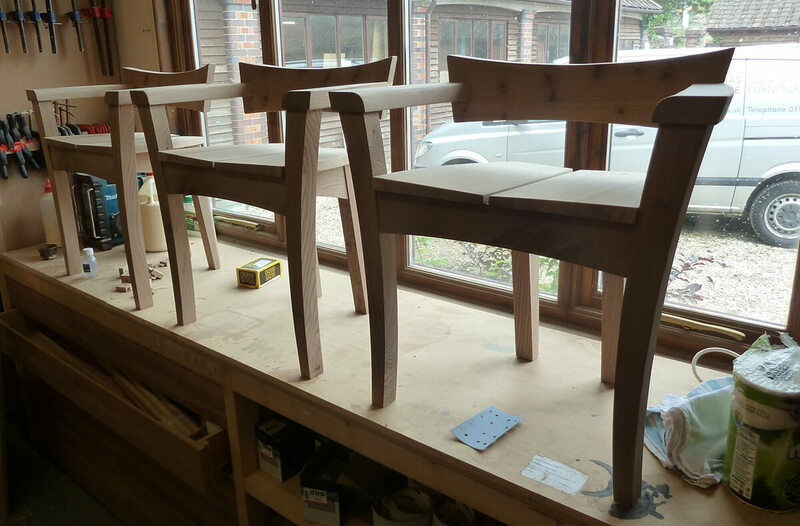 ‘Perch’ chairs in elm as ruby wedding present to match existing STP table and benches. 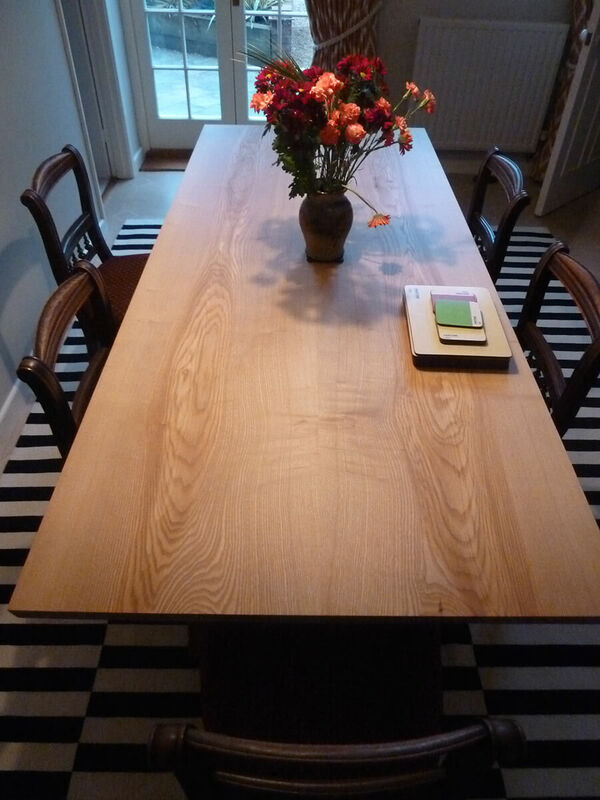 Top right – Stunning olive ash and fumed oak dining table – chairs to come! 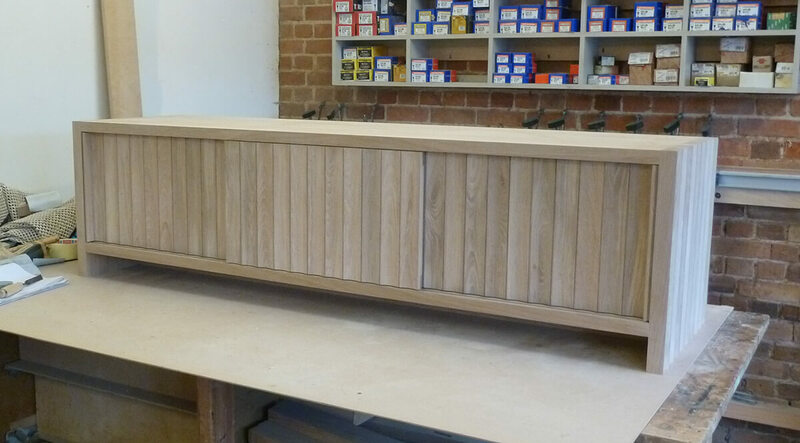 Bottom – Media sideboard in oak with scollop detail panels. Next years projects are already beginning to take shape in the workshop. We are currently working on a beautiful study, which is the first element of a major new build near Beaulieu in the New Forest. We also have two large kitchens and interior projects lined up for the spring / summer, a classic 1920’s modernist interior in Hampstead, the next stage of the Bliss work in Norfolk, 60 Officers Mess chairs for a Guards regiment, a church alter and lots more we are in discussion about. 2017 looks like it could be even more exciting than 2016!